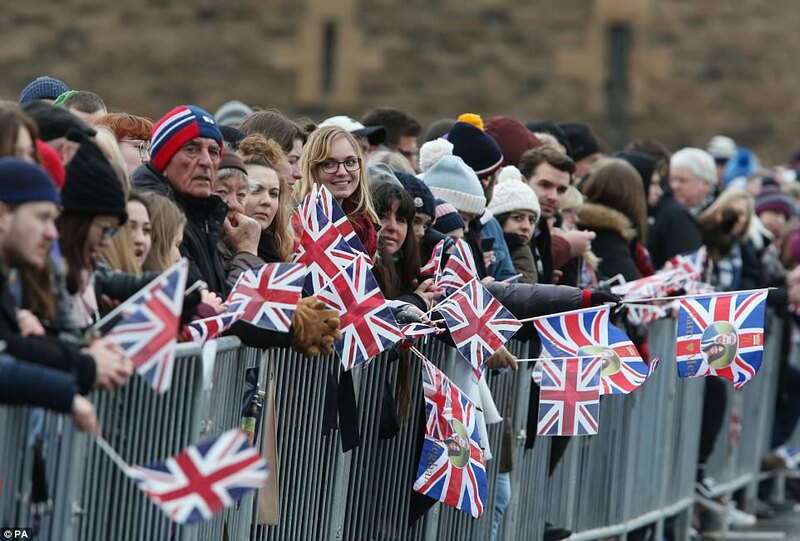 Prince Harry received a rapturous welcome with Meghan Markle from the people of Edinburgh today – but also reserved praise for one well-wisher. 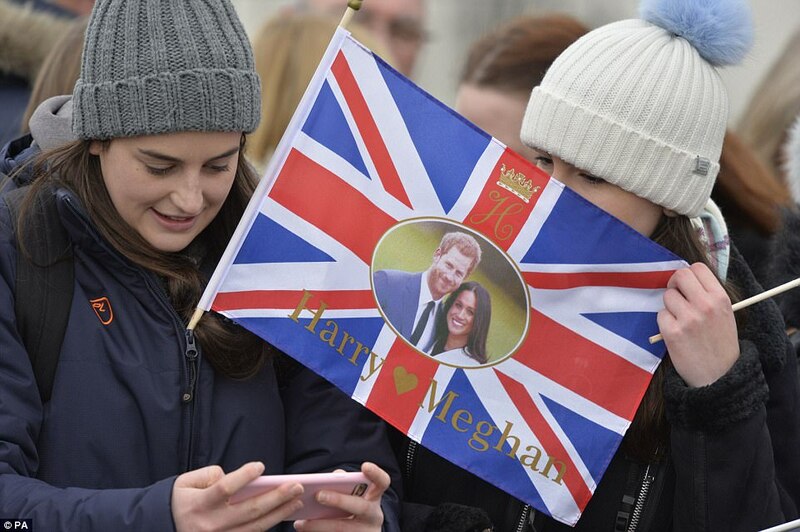 Meghan also revealed to onlookers that her hen do is all planned, although she does not know what it is. 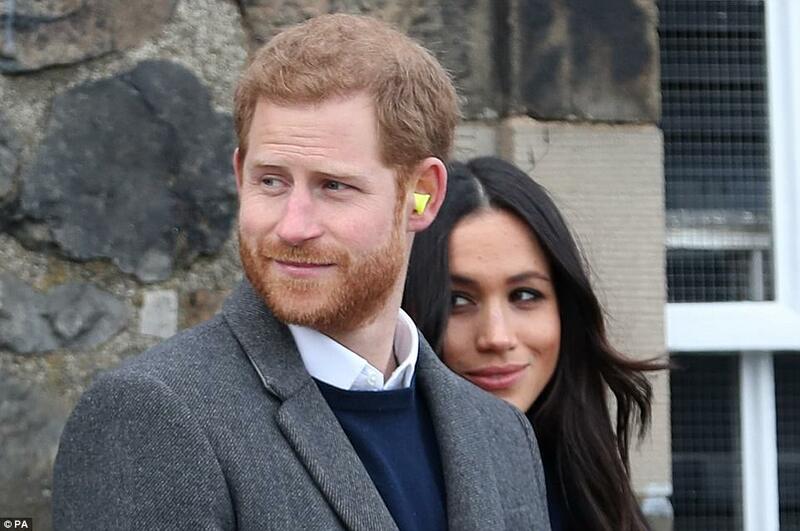 She told well-wishers in Edinburgh that it is 'sorted', although party-loving Harry isn't quite as prepared. 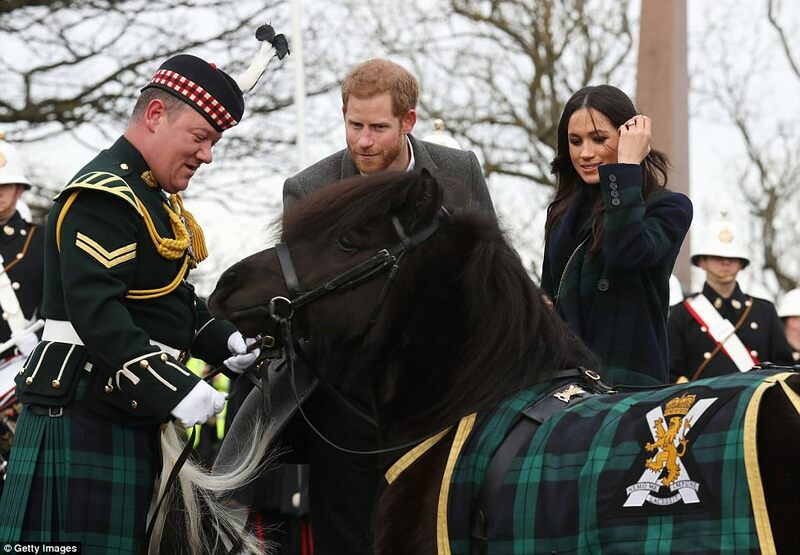 Pony Major Mark Wilkinson introduced Meghan and Harry to Cruachan IV, a Shetland pony, at the end of their walkabout where they received flowers, posed for pictures and sympathised about the cold conditions. 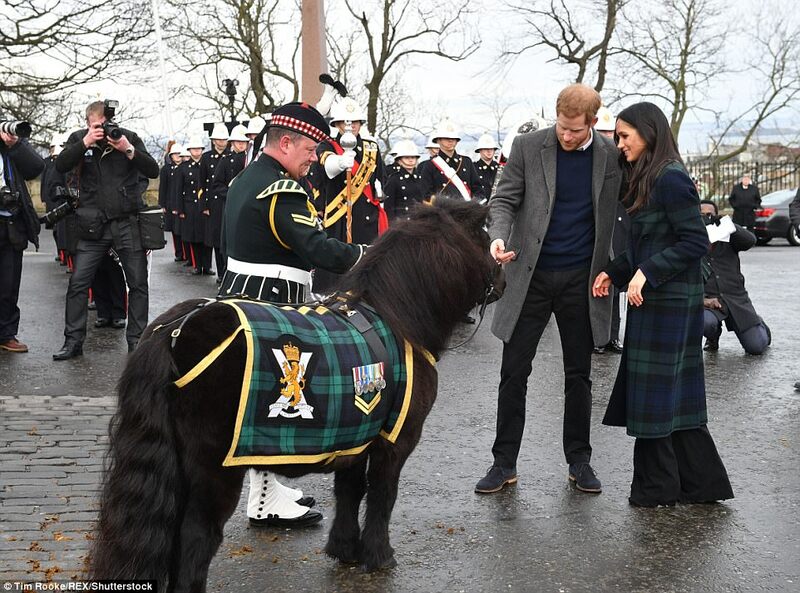 The nine-year-old pony - the mascot of the Royal Regiment of Scotland - famously tried to eat the Queen's posy during the monarch's visit to Stirling Castle - and this time startled away Harry. 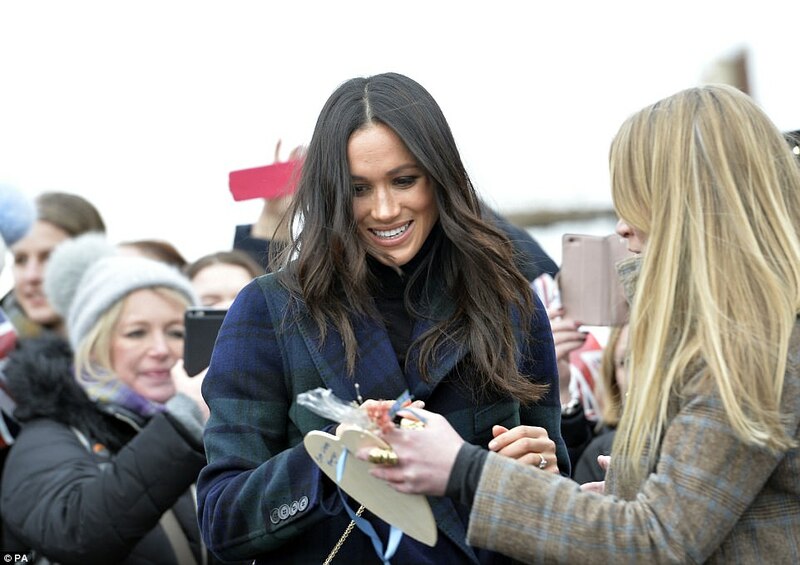 Meghan - who wore a £2,000 Burberry tartan coat, matching that worn by the pony, with trousers by Veronica Beard - was handed an early Valentine's gift on a heart from a young admirer as the couple delighted royal fans. 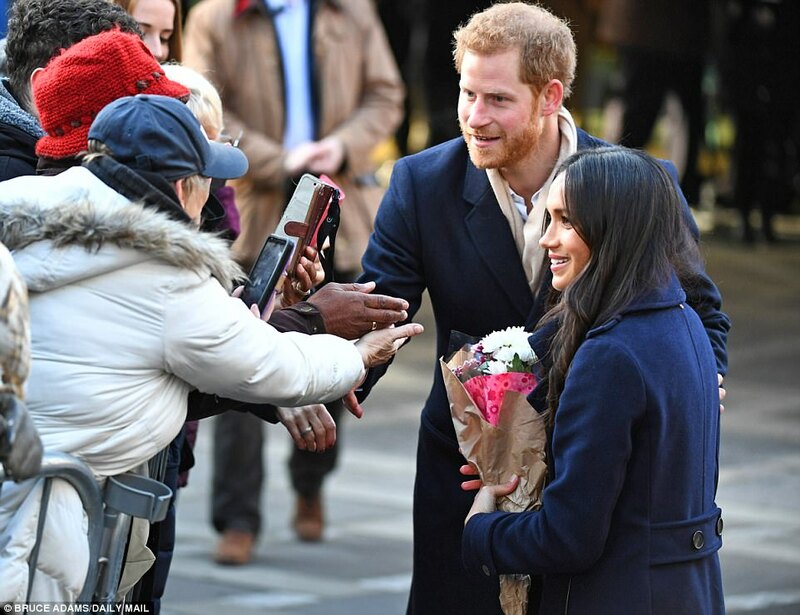 One amorous male well-wisher gave Ms Markle a bunch of roses and told her 'Don't marry Harry, marry me' as she and Harry greeted crowds on the castle's esplanade. 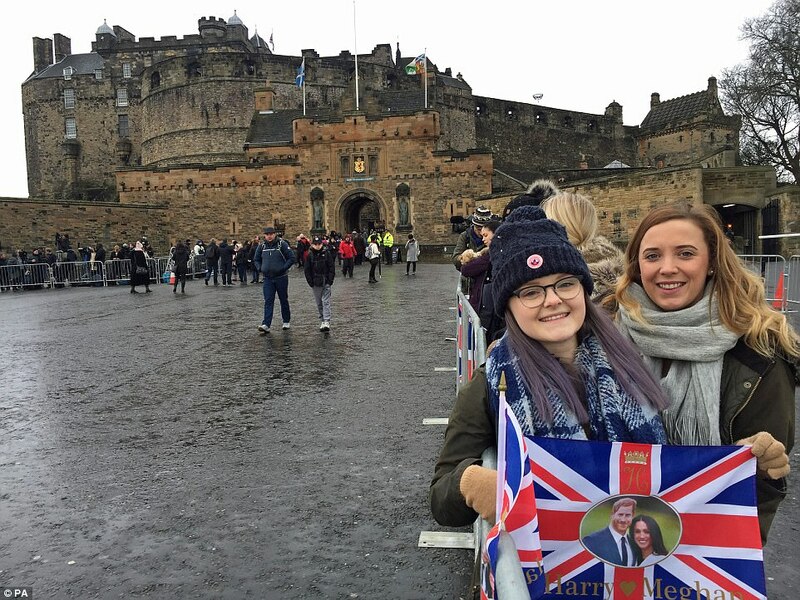 Hundreds of well-wishers had braved the conditions to stake the best place to spot the royal couple on the esplanade outside Edinburgh Castle this morning, despite the cold and wet weather. 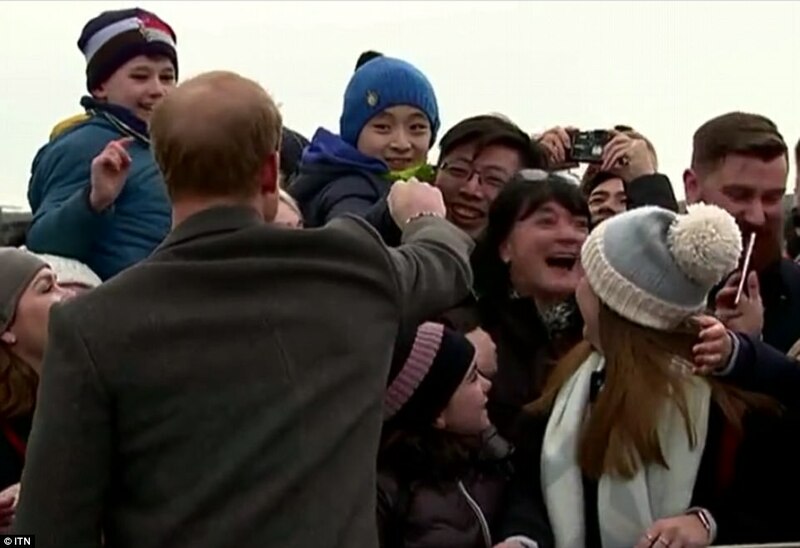 With the centuries-old fortress as a backdrop the couple began shaking hands, saying hello and thanking the well-wishers for coming to see them. 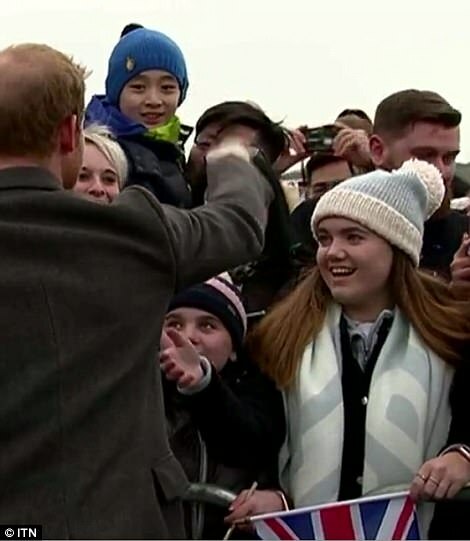 Harry and Meghan were also both given gifts by young fans. 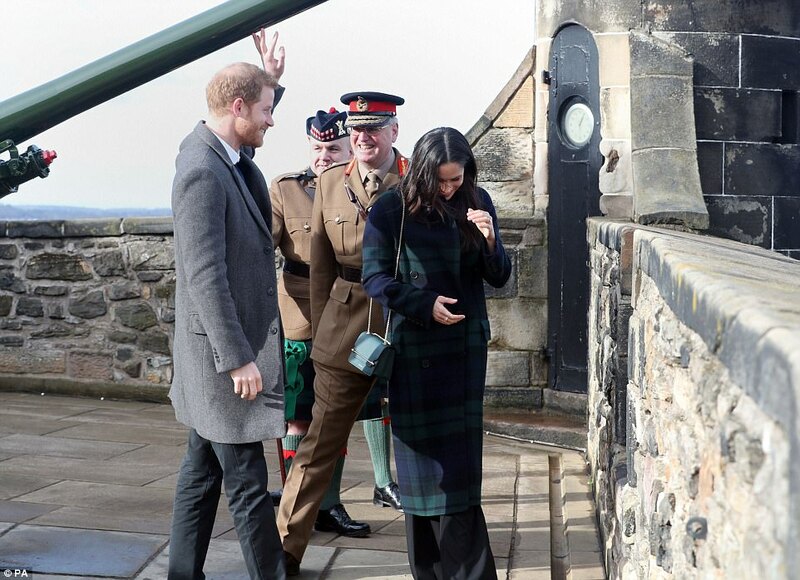 Harry and Ms Markle joined Sergeant Dave Beveridge, District Gunner, Royal Artillery for the firing of the One O'Clock Gun. They were given ear defenders before standing behind the gun which dates back to 1861. 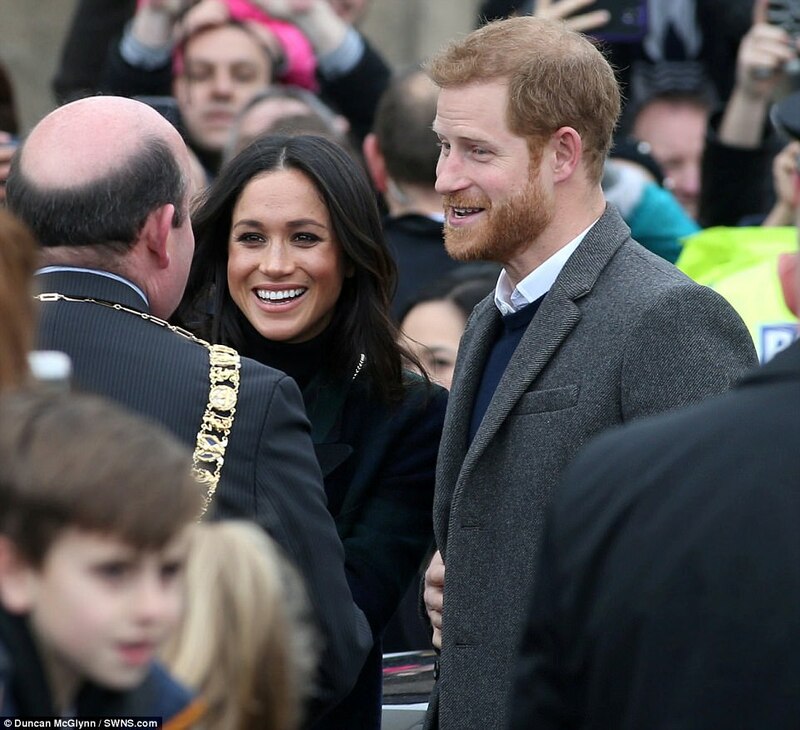 The couple also chatted to cadets and took in views across the city, before briefly waving to the crowds as they departed. Harry later said work done by a cafe supporting homeless people 'needs to be across the UK as soon as possible'. 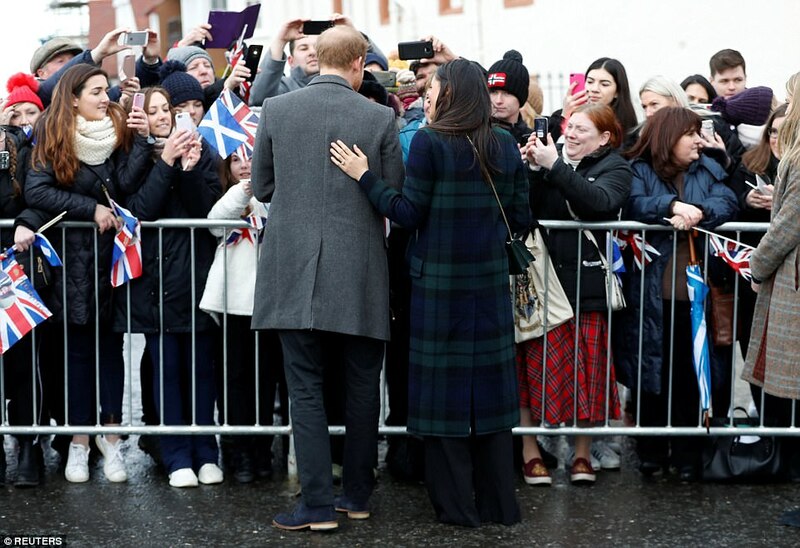 Harry and Meghan were at Social Bite in Edinburgh to meet those who use and work with the organisation, with the 33-year-old rubbing his hands together after walking in from the 'freezing' conditions outside. 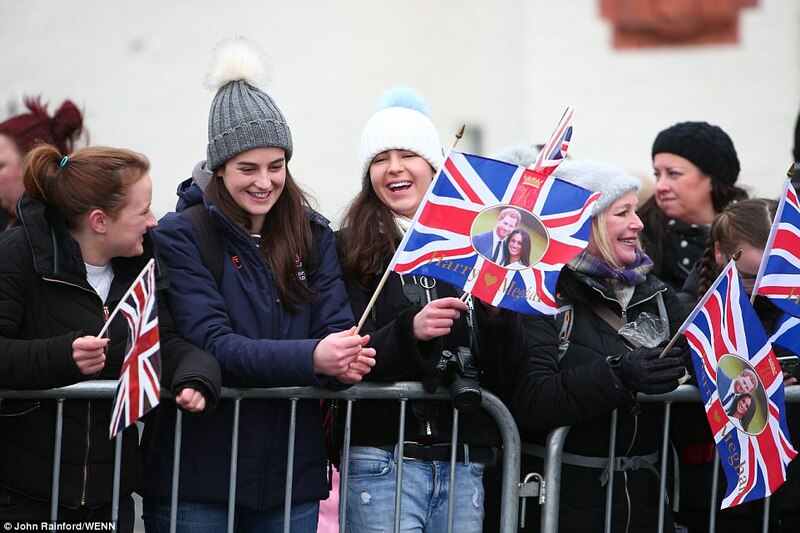 But the weather did not put off a cheering crowd wanting to welcome them, who were waving love hearts and flags - with some of them having queued for more than four hours to catch a glimpse. 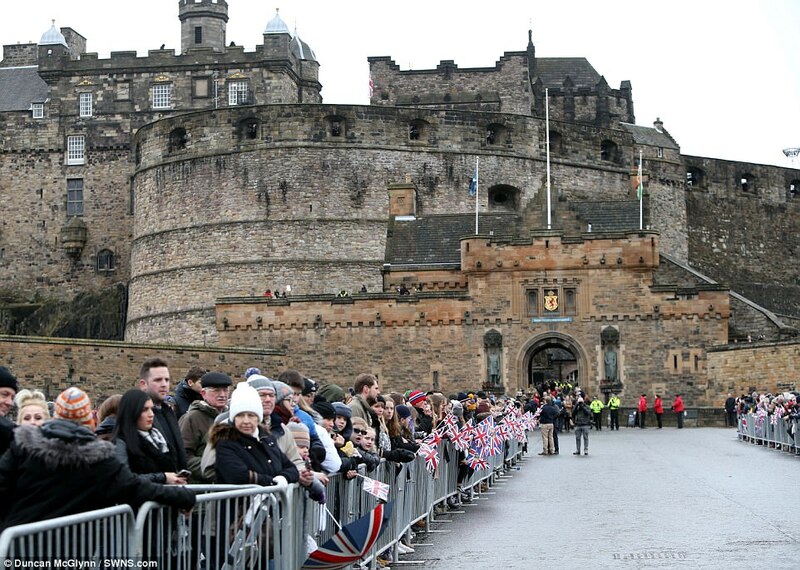 The couple were given ear defenders at Edinburgh Castle before standing behind the gun which dates back to 1861. Speaking afterwards, Mr Littlejohn said they were willing to share what they have learned with other organisations to tackle the issue elsewhere. 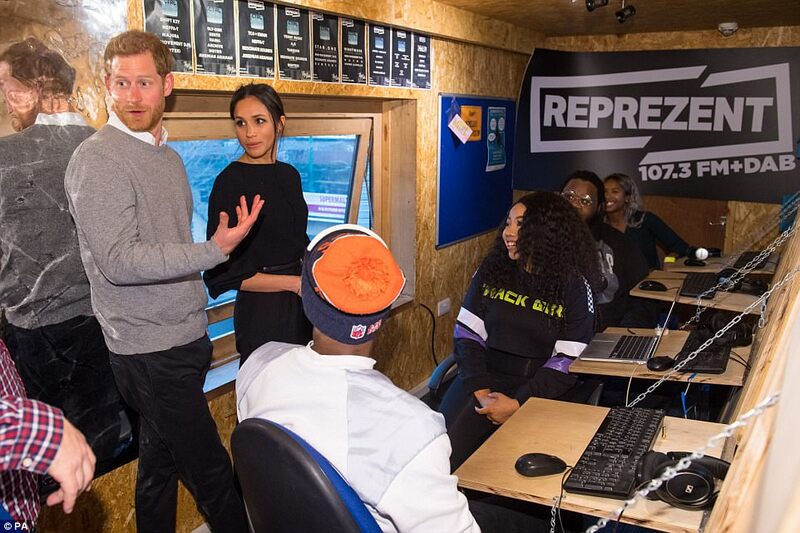 Harry and Meghan spoke with the organisation's volunteers, customers and also staff who have been affected by homelessness. 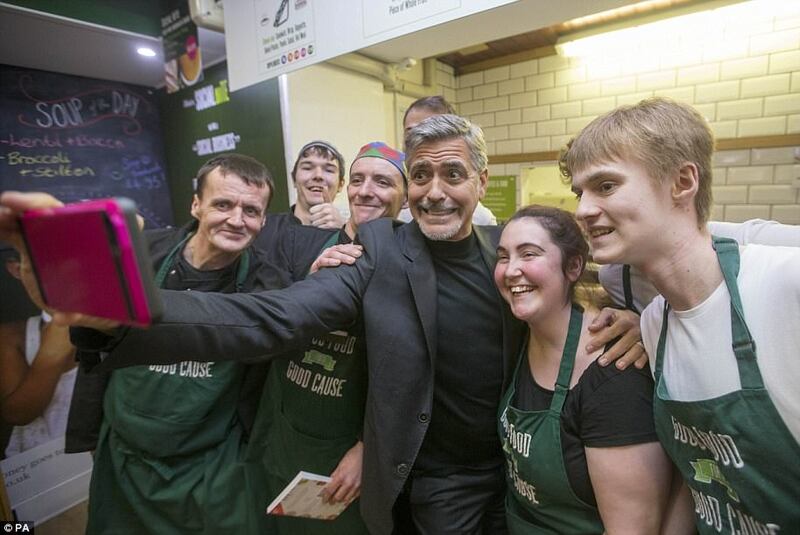 When speaking to volunteers Liz Cann and Alice Smith as well as customer George Whyte, Harry went on to talk about his love of food's ability to bring people together. 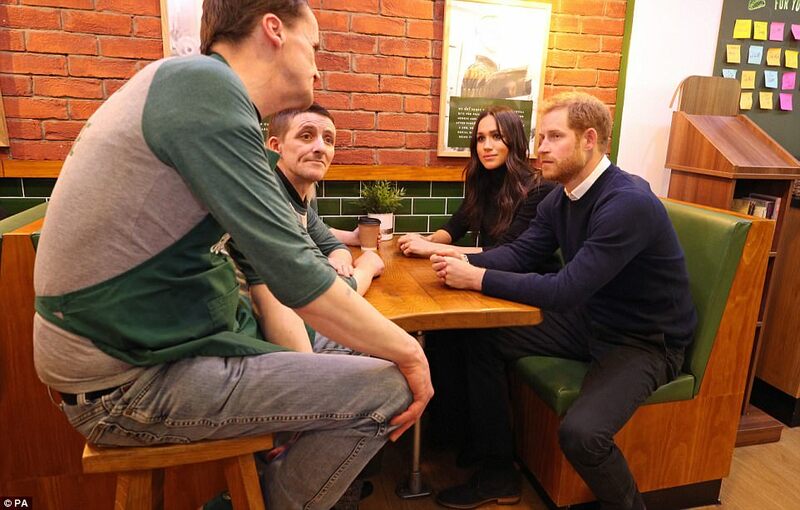 The soon-to-be husband and wife also met with other staff at the Edinburgh cafe, with Ms Markle saying she would like to work there as it seemed fun. Sonny Murray, 38, was homeless for two years and rough sleeping for four months. He said working for Social Bite had helped him to turn his life around and told the couple he urged homeless people to get involved with the organisation. Mr Murray described the pair as a 'really lovely couple' who 'sat and spoke away to us' about their backgrounds. The firm also plans to open a 'village' for homeless people later this year, which would give people without accommodation a home so they can try to find some security. 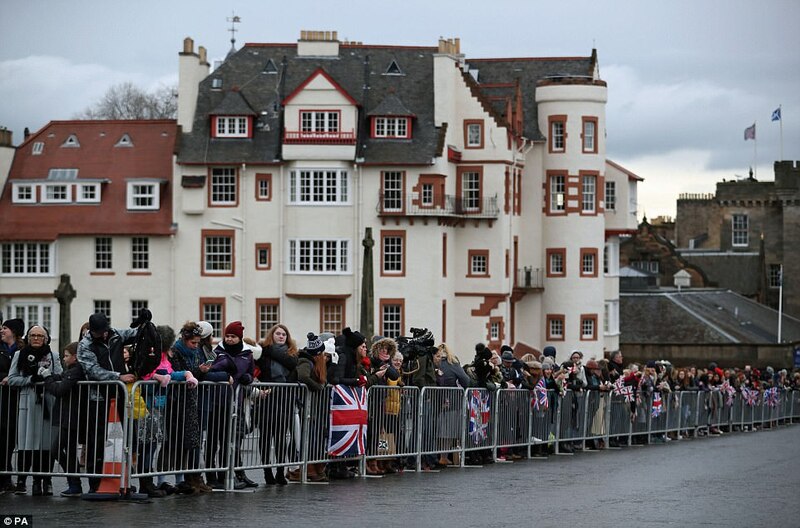 Harry and Meghan later arrived at the Palace of Holyroodhouse in their final public engagement on their visit to Edinburgh. 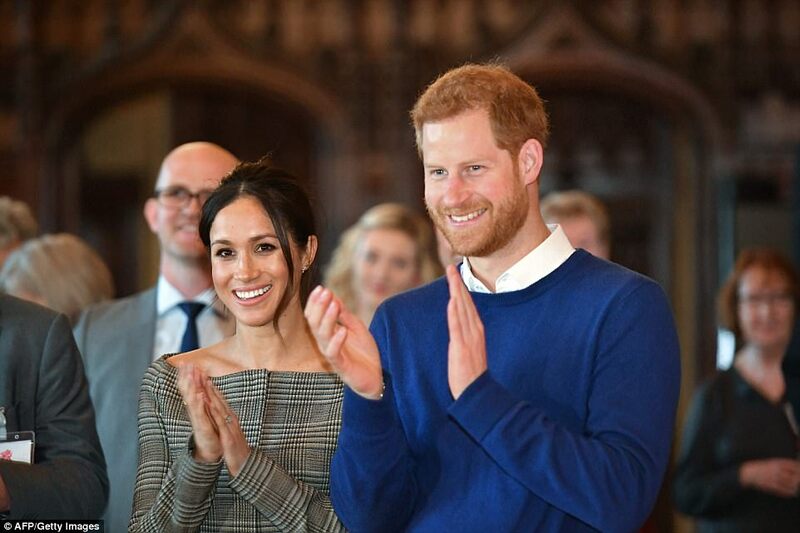 The couple were attending a reception to celebrate youth achievements as part of Scotland's Year of Young People 2018. 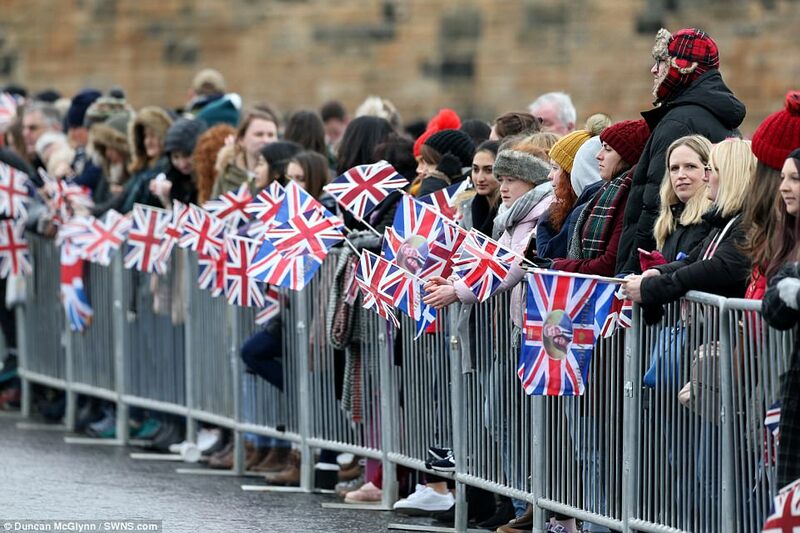 Crowds lined the approach to the palace as the royal couple arrived. Ben Mason, nine, and the First Minister's mentee Charlotte Liddell, 21, took the royal couple around the reception for the Year of Young People 2018. 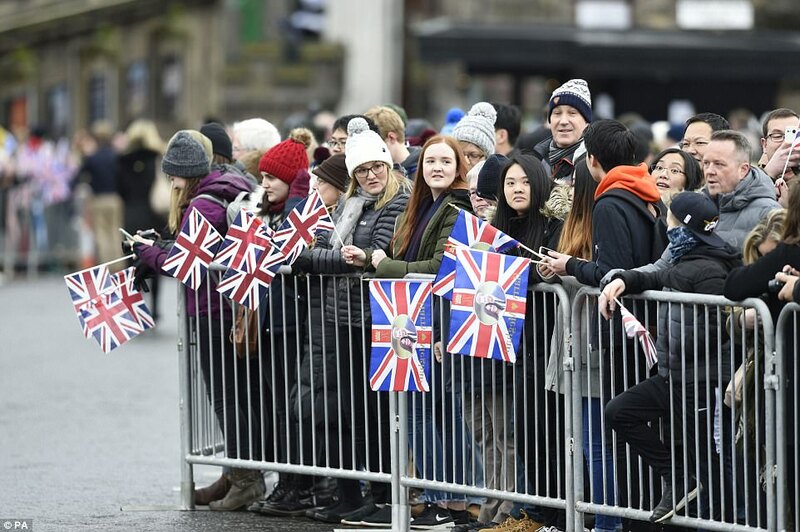 First Minister Nicola Sturgeon was also in attendance as Harry and Meghan spoke to representatives from youth groups and charities on the final public engagement of their Edinburgh visit. 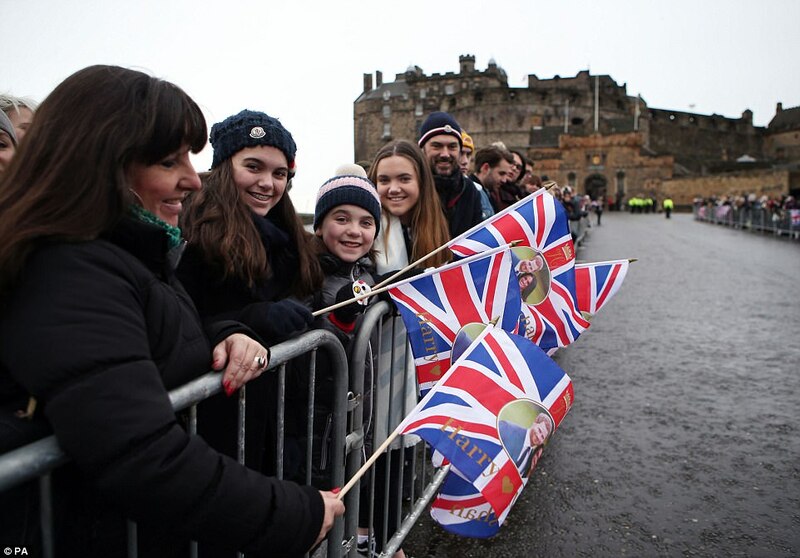 Sarah Coronado, 28, a masters student from Mexico studying at Edinburgh University, was one of the first well-wishers to arrive at the castle's esplanade. She said: 'Seeing the couple is a once-in-a-lifetime opportunity. We don't have these visits in Mexico or my hometown of Monterey. 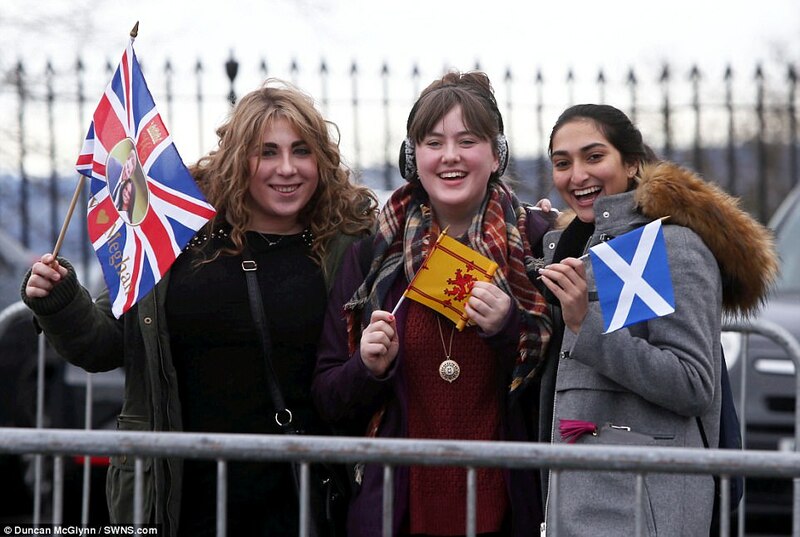 Ashley Torres, 25, a law student at Edinburgh University, had brought a bunch of tulips for the couple. 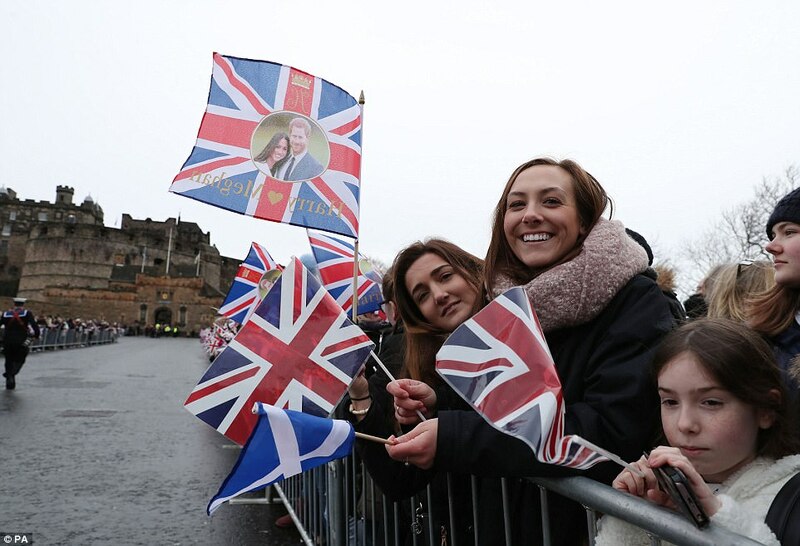 Friends Maggie Binnie, 29 and Alice McCourt, 23, both Scottish students, had staked a place on the esplanade against the crash barriers and waved Union flags featuring a picture of the prince and his fiancee. Her mother had the mildest complaint, however. 'She gave them to her aide, saying they were scones,' said Lynda Clark, 70 – pronouncing the word to rhyme with 'Gone'. She added: 'The correct pronunciation is 'Scone' – to rhyme with bone. 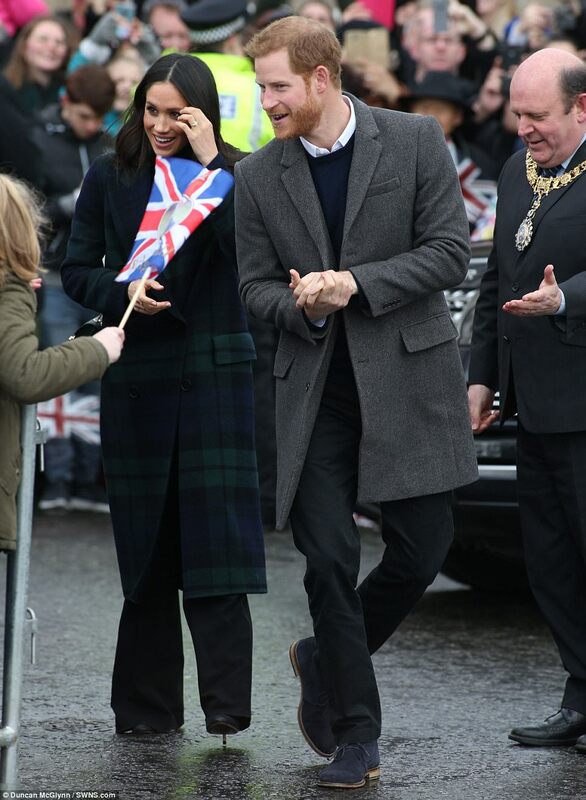 Meghan was wearing a £1,995 Burberry coat with the official tartan of Black Watch, the 3rd Battalion of the Royal Regiment of Scotland. 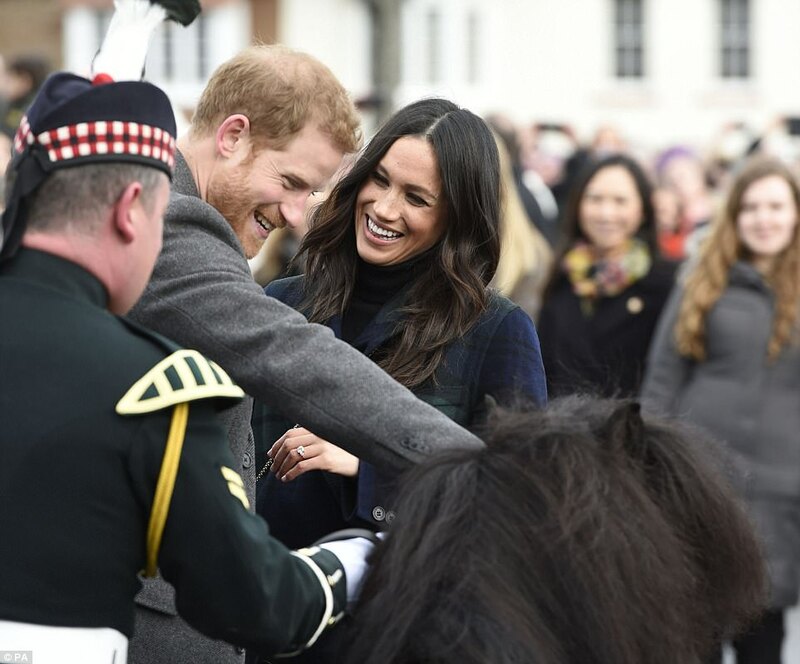 The choice was not only a nod to her being in Scotland, but also that her future father-in-law Prince Charles is Royal Colonel of the battalion. The Black Watch tartan was said to have been initially used by the Independent Companies who policed the Highlands under General Wade. They were formed in 1725 and later became the Black Watch in 1739. The material is also the same tartan as the Campbell clan tartan, but it is now 'universal' and can be worn by anyone with no tartan or clan connections. 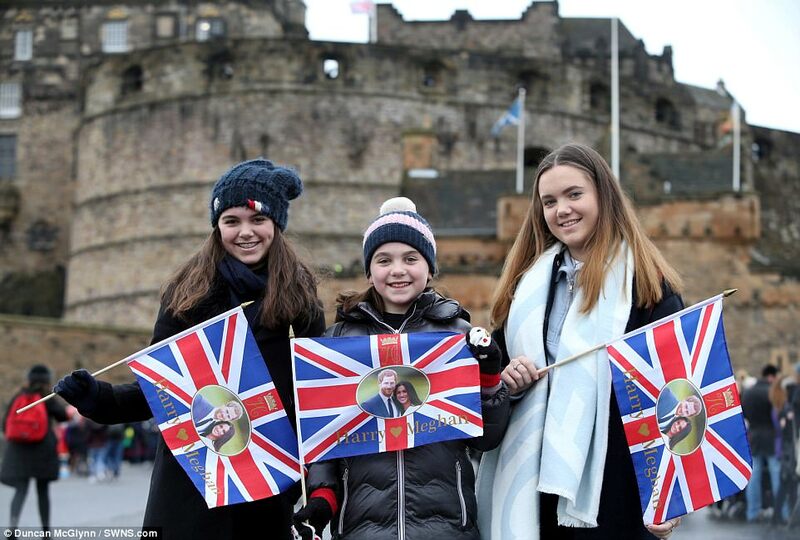 As the band of HM Royal Marines Scotland played outside the entrance to the castle, two young girls gave Harry a hand-made sign decorated with hearts and the couple's names – albeit with a slightly premature promotion for Ms Markle. 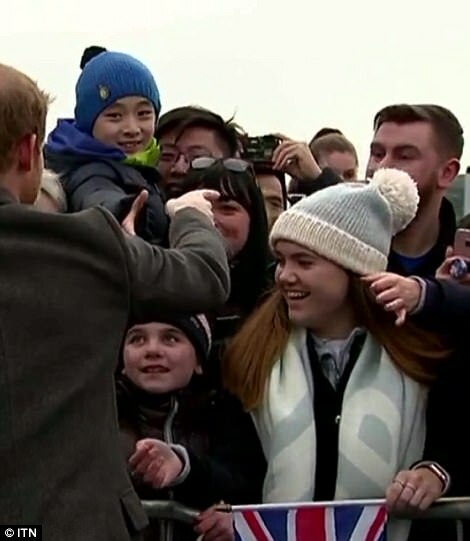 'It said, 'Princess Meghan and Prince Harry',' said Orlaidh Connors, 10, from Edinburgh. 'They both said thank you.' 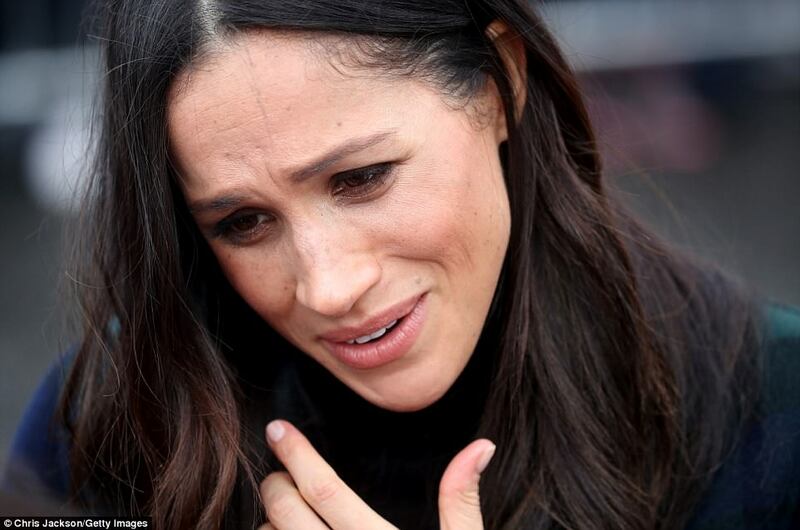 What did she think of Harry and Meghan? 'They're cool!' she said enthusiastically. 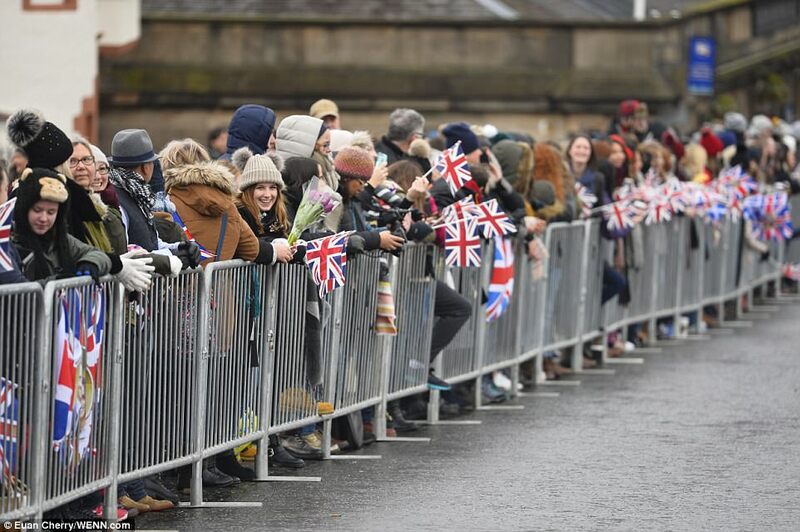 Harry and his bride-to-be met well-wishers before heading inside the historic fortress to watch as the One O'clock Gun was fired, a tradition started in 1861 to mark time for ships in the Firth of Forth. First they had what one royal aide described as a 'five minute warm up' in the Governor's house before watching the firing of the gun. The loved-up couple adorably held hands as they strolled onto the ramparts to watch the 105 millimetre L118 Light Gun go off. After a briefing from Sergeant Dave Beveridge, of the Royal Artillery, who fires it daily from Tuesday to Saturday, they put in ear defenders and waited for the blank to send a powerful explosion ringing out. Sergeant Beveridge then pulled the still smoking 'cartridge case' - which had been packed with six ounces of gun powder from the chamber. 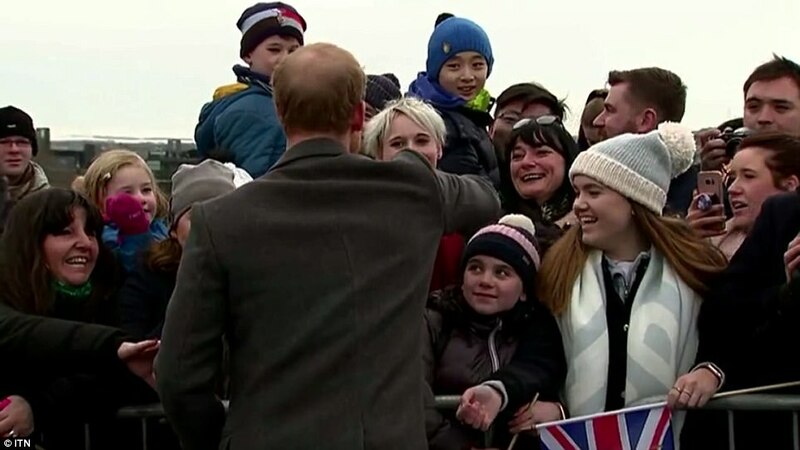 He said: 'I gave Prince Harry and Meghan a very brief history of the 1 o'clock gun and why it was still firing. Harry asked me about my history, so I told him I did 24 years in the army and then I got this job. 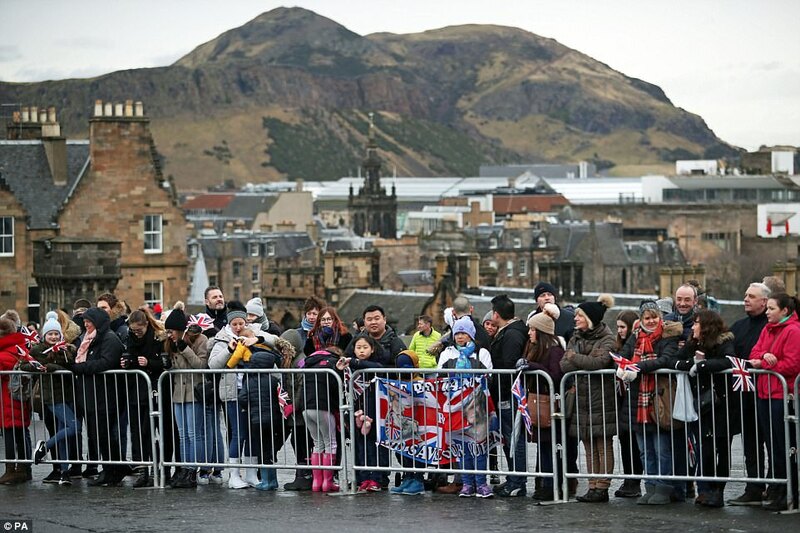 Una Mallon, a mother of four, 47, from Belfast, was excited as she tried to catch a glimpse of the couple. 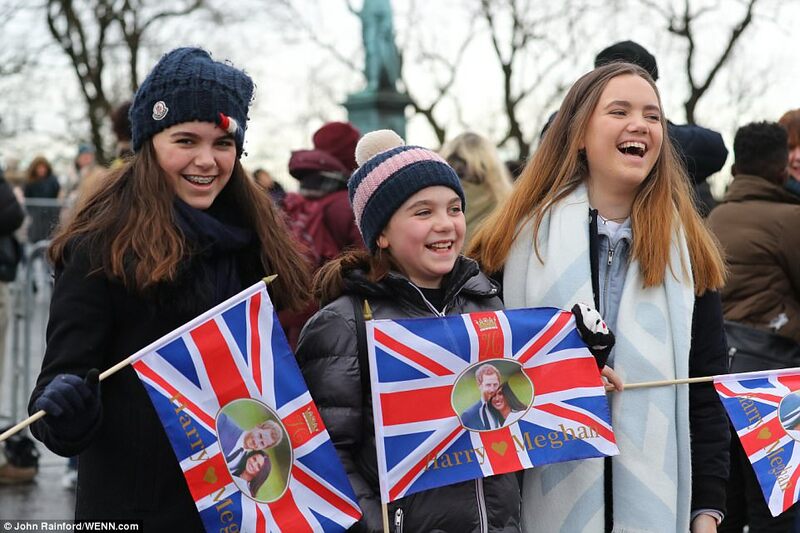 She said: 'We are expecting to see Meghan and Harry, we are so excited. 'My prediction is that Meghan is going to be our new Diana. A wee touch of Meghan adds a bit of sparkle. She's already working behind the scenes as she's doing secret visits. 'She is passionate about her causes and I think Harry and her are going to be the perfect team. I always have a soft spot for Kate and William but I think together the boys are doing a great job and their partners show great support. 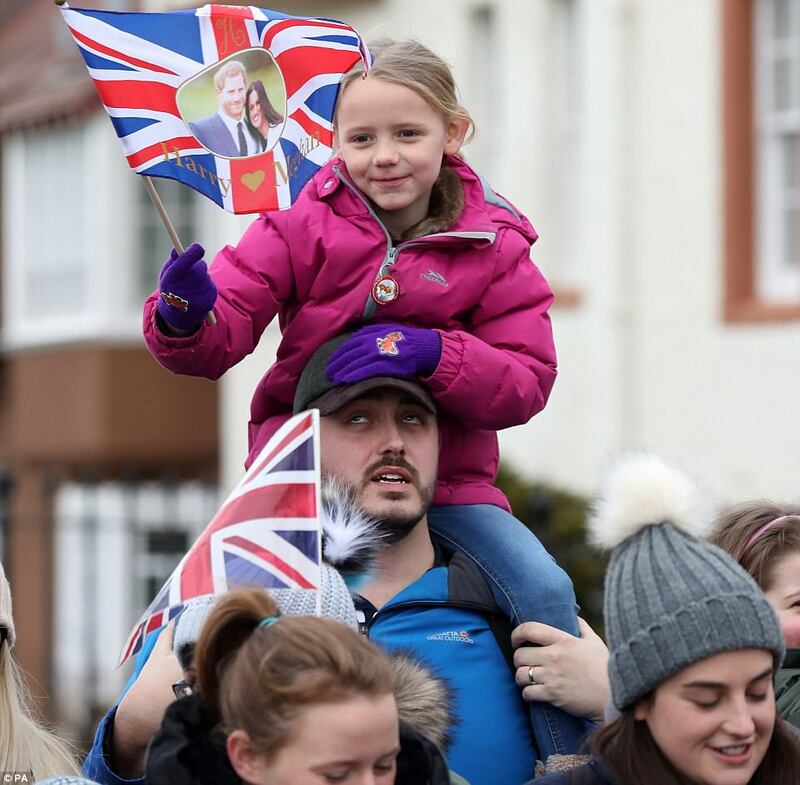 Kim Cameron, 55, from Danderhall, Midlothian, added: 'I just want to see them because I love the Royal Family. I want to show them love and support. Harry is our favourite, he seems more down to earth. 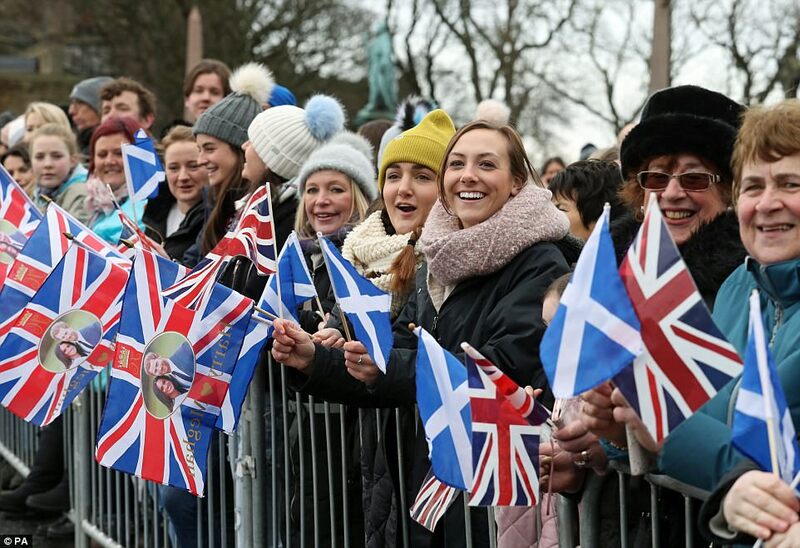 The trip to Scotland is the fourth public appearance Meghan and Harry have made together and follows successful visits to Nottingham, Brixton in south London and Cardiff in the months that followed their engagement announcement in November. 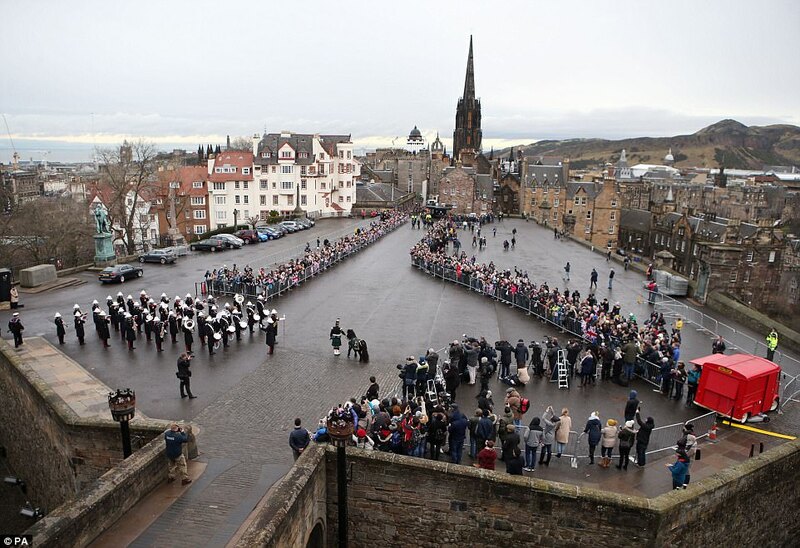 Also on the esplanade were the Royal Marines Band Scotland who played for Meghan, the former Suits actress, and the Prince who became Captain General of the Royal Marines in December 2017. 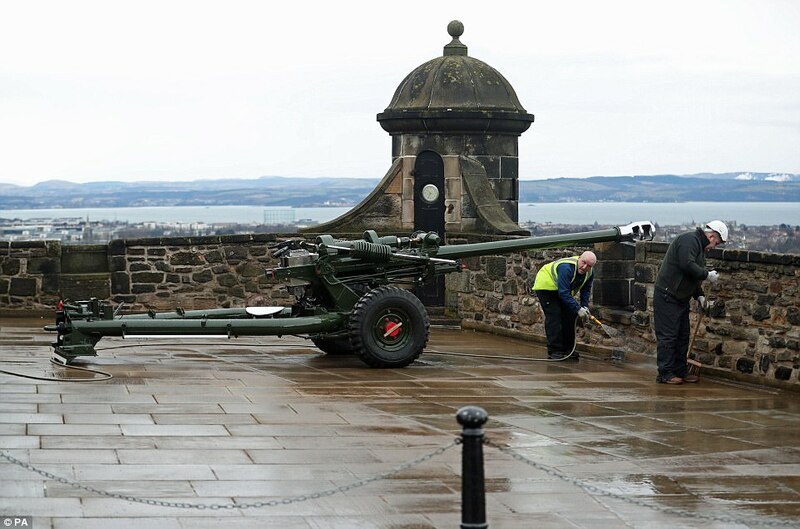 Inside the castle at the historic Edinburgh Garrison, which looks out across the city, the couple watched as the One o'clock Gun was fired, a tradition started in 1861 to mark time for ships in the Firth of Forth. 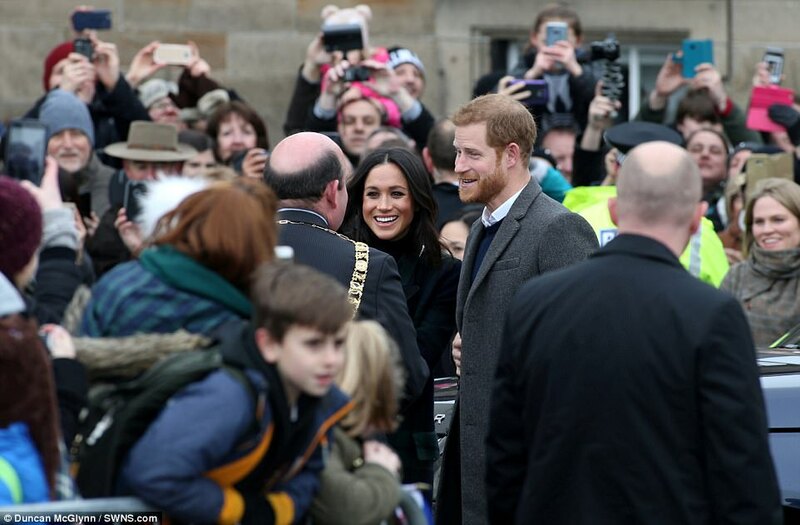 The couple also went to the New Town to visit Social Bite, a social enterprise cafe which distributes 100,000 items of food and hot drinks to homeless people across Scotland each year, as well as employing staff who have experienced homelessness themselves. They were the latest in a string of high-profile visitors to Social Bite premises. 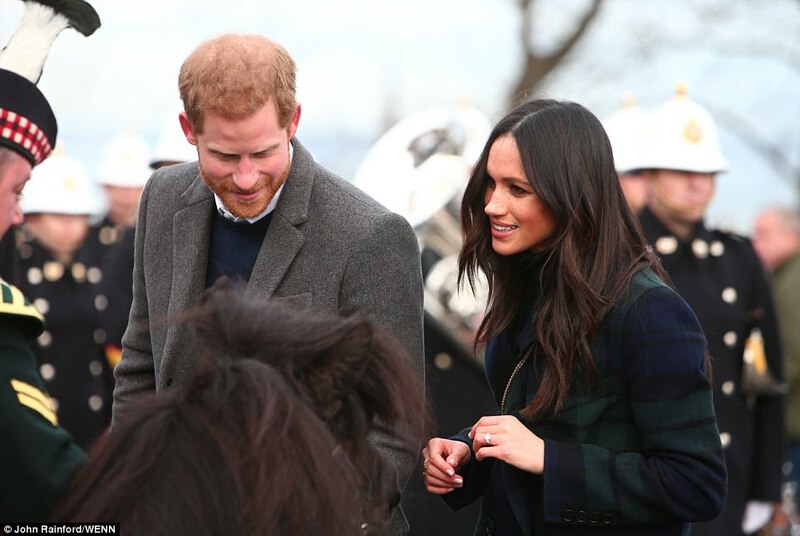 Prince Harry and Ms Markle will round off their visit by attending a reception at the Palace of Holyroodhouse to celebrate youth achievements marking Scotland's Year of Young People 2018, an initiative that aims to inspire Scotland through its young people. How Shetland pony Cruachan IV has a rather naughty history... and once tried to eat the Queen's posy! 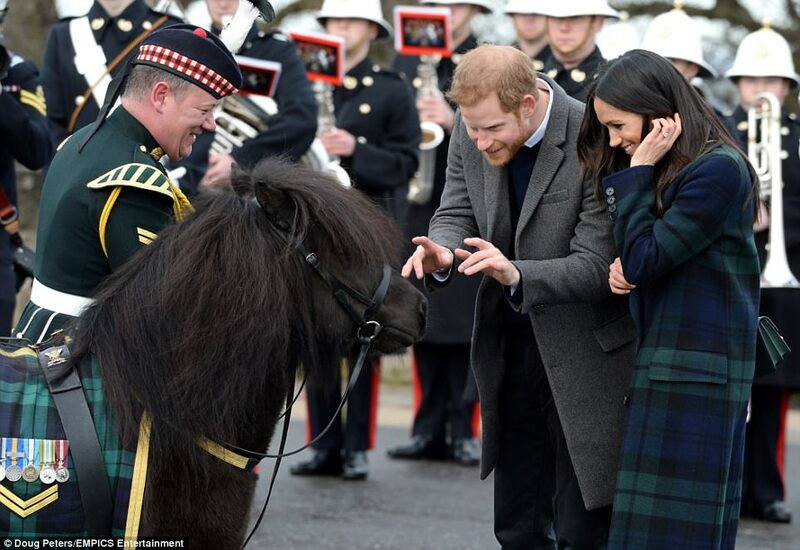 Cruachan IV is a Shetland pony and mascot of the Royal Regiment of Scotland with a very naughty history when it comes to the Queen. 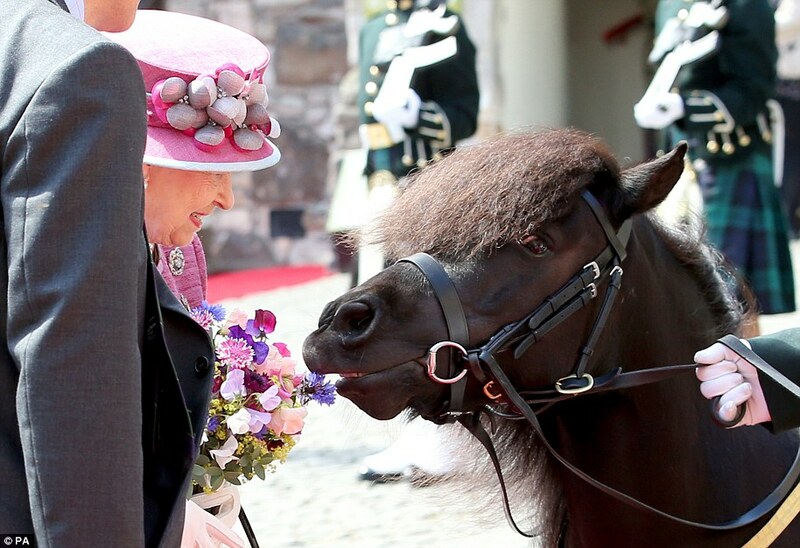 The nine-year-old pony famously tried to eat the Queen's posy during the monarch's visit to Stirling Castle in July 2017. And disaster also nearly struck in August 2014 when the naughty pony rolled his top lip back as the Queen approached and appeared to try to bite her. 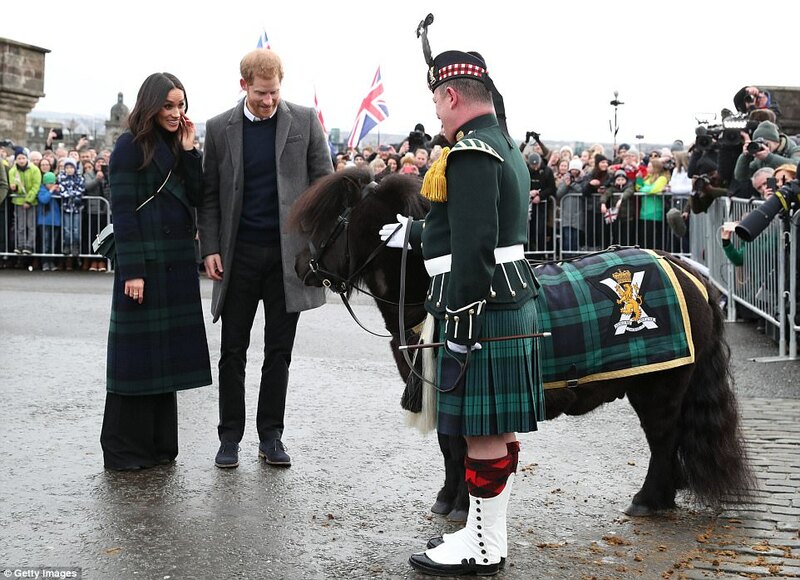 Pony Major Mark Wilkinson introduced Meghan and Harry to the pony at the end of their walkabout around Edinburgh today. 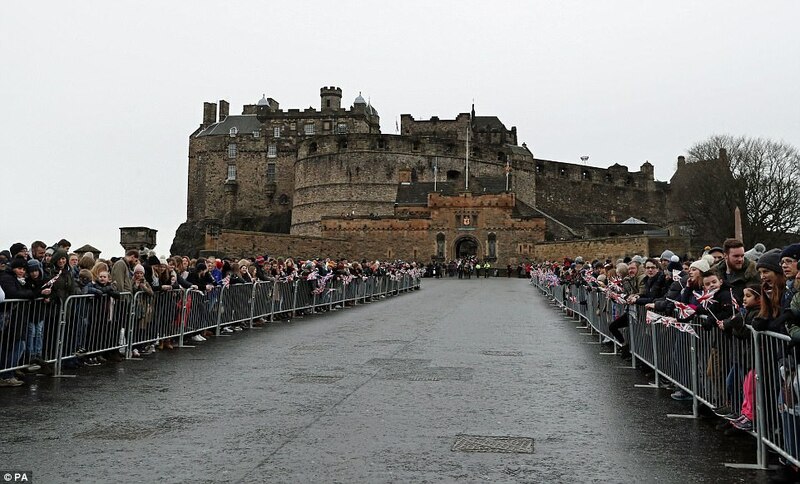 But last July the Queen was filmed telling Cruachan IV to 'go away' when he tried to take a bite out of her posy during a visit to Stirling Castle. The Queen, who has a lifelong love of horses, swiftly pulled the blooms behind her back before saying to the pony's minder: 'They always try to eat the flowers'. 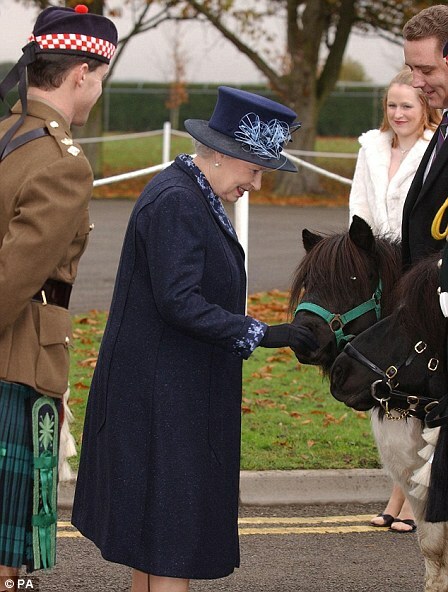 The minder could be heard telling the pony to be 'gentle' as Her Majesty extended her gloved hand towards him. A month later in August the Queen was reunited with the pony, who was on much better behaviour but did neigh as the Queen turned to walk away. Three years earlier in August 2014, disaster almost struck when the naughty pony rolled his top lip back as the Queen approached him. The Shetland mascot tradition began in 1928. The first to march with the regiment was Cruachan I, a jet black Shetland pony gelding, who joined with the title of 'Pony Major'. Since then, the position has been held by another three black Shetland geldings, with Cruachan III, a pony especially adored by the Queen, retiring at the grand old age of 23 in 2012. During his tenure, he made regular visits to Balmoral and led the Argyll and Sutherland Highlanders and the Royal Regiment of Scotland, at events and parades, including the Edinburgh Military Tattoo. 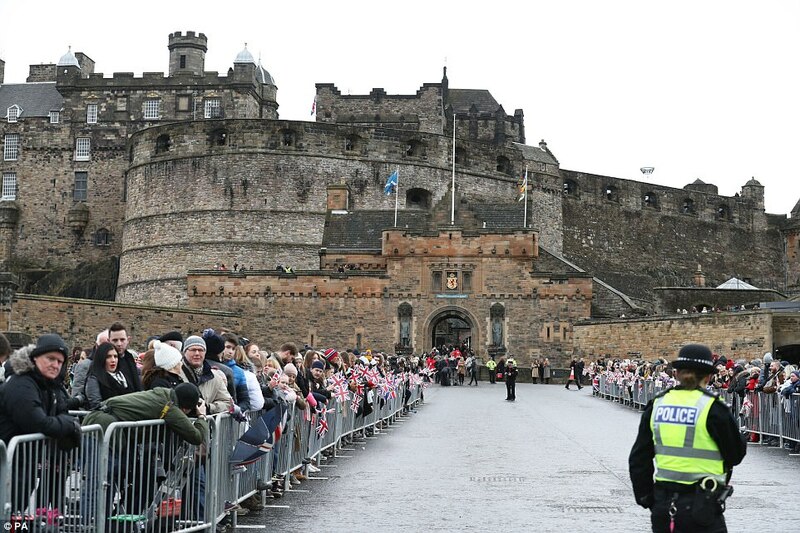 'He's done a lot of parades in his time and he was a real favourite of the Queen,' revealed handler Captain Dougie McDougall at the time of his retirement. Her Majesty is a long-standing fan of Shetland ponies, having begun her own riding career at the age of four on the back of another Shetland, Peggy. 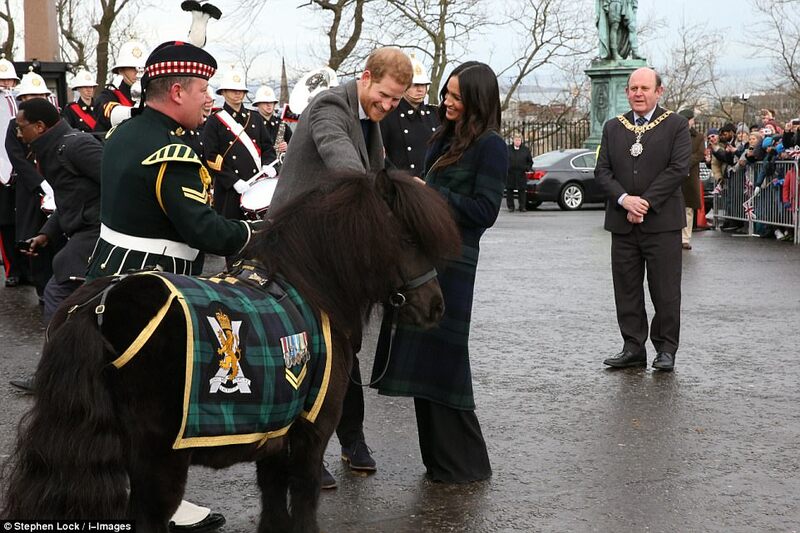 She is also a fan of another Scottish breed, the Highland pony, which she breeds from a stud attached to Balmoral. Social Bite is a café network that distributes 100,000 items of food and hot drinks to the homeless each year. The organisation runs social enterprise cafés throughout Scotland with the aim of tackling homelessness. It employs staff who have faced homelessness themselves and are working on a housing project for the homeless. 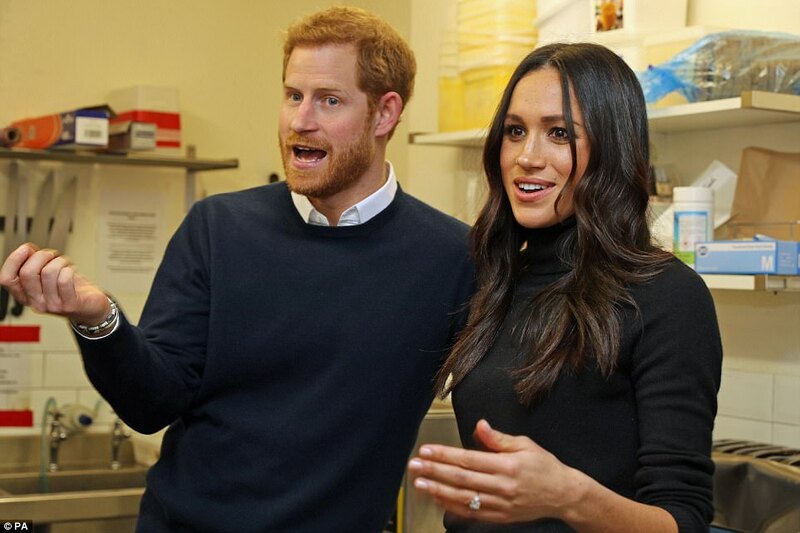 During their visit today, Harry and Meghan are learning more about the social enterprise and touring the kitchen. 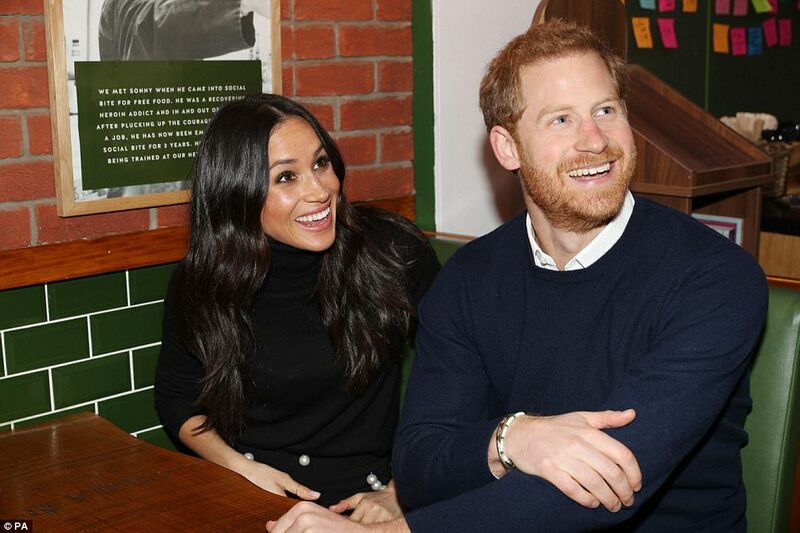 The royal couple will be the latest in a string of high-profile visitors to Social Bite premises. 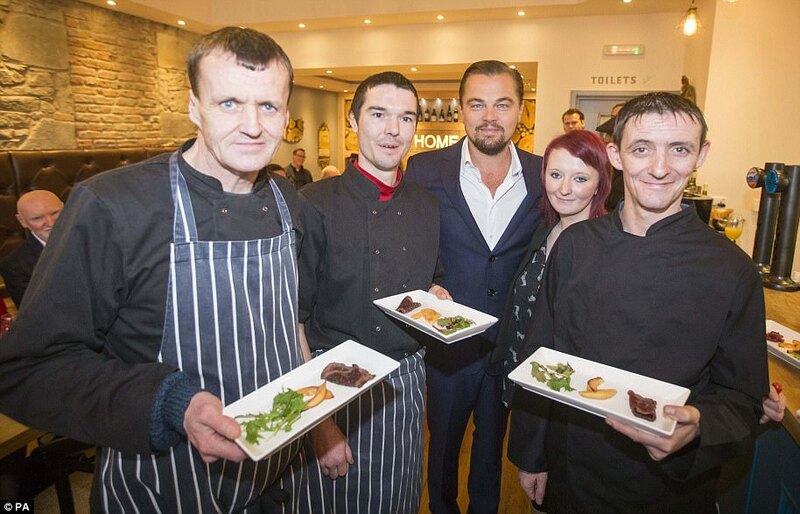 Hollywood star Leonardo DiCaprio stopped for lunch at Social Bite venture Home in Edinburgh's west end in 2016. 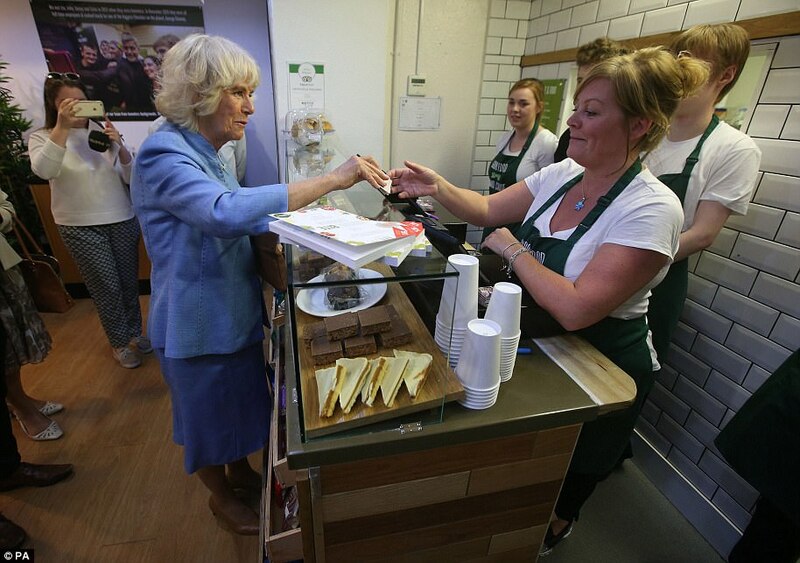 Meanwhile the Duchess of Cornwall and actor George Clooney have been to Social Bite's Rose Street branch. 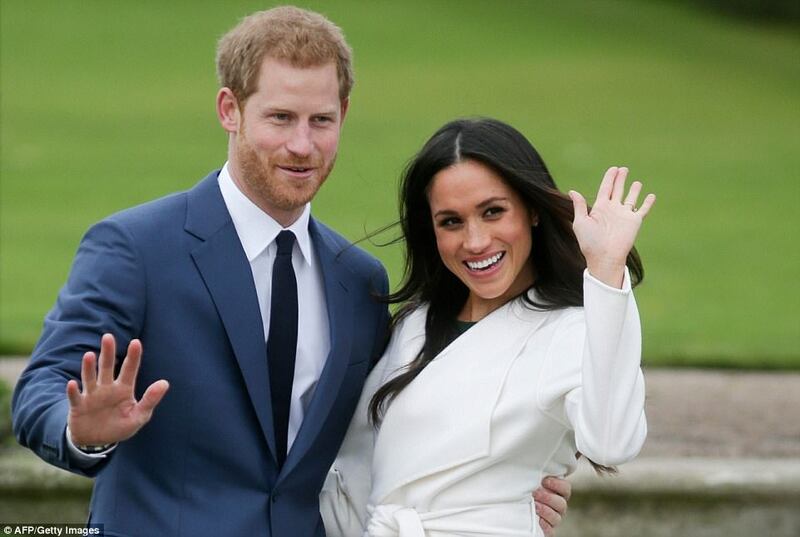 Royal fans might have expected Meghan Markle to liven up the royal dress code with a touch of Hollywood glamour, but the bride-to-be has been adding her own style stamp by adding 'cool edges' to her chic outfits. 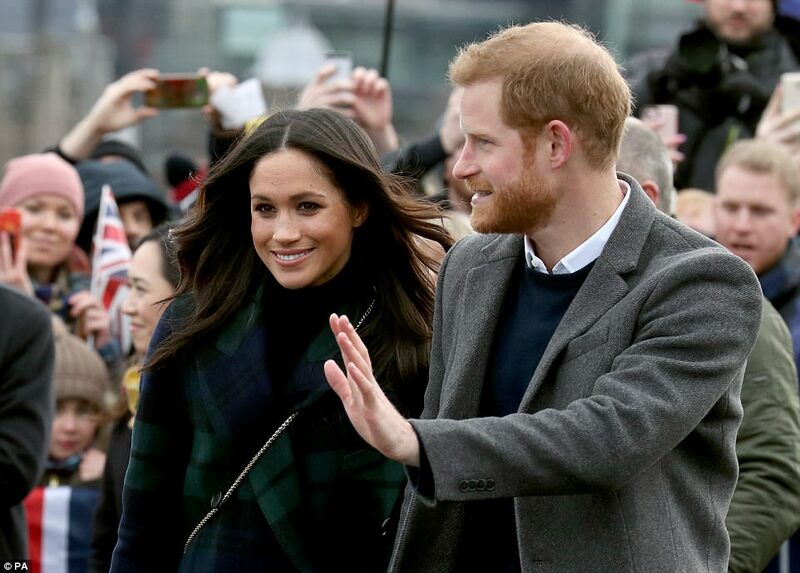 This is Meghan's fifth official engagement with Harry and her Veronica Beard flares make it the fourth time she's worn trousers, even donning jeans for her first official visit to Wales in January. And rather than carrying a neat clutch like Kate or a handbag in the style of the Queen she was the first royal to step out with a trendy cross body bag, opting again for Scottish brand Strathberry. 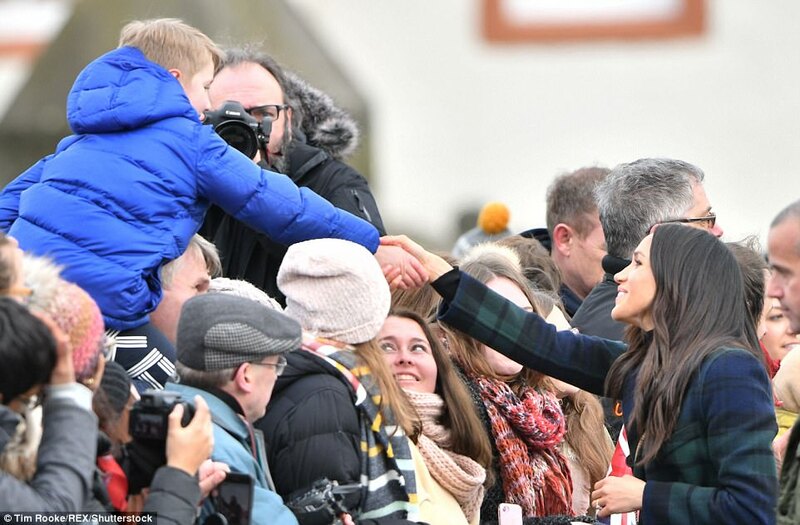 While the Queen and Kate are never seen in all-black outfits, except for events such as Remembrance Sunday or on the red carpet in the case of the Duchess of Cambridge, Meghan has made it her signature look since taking up royal duties. Celebrity stylist and designer Lucas Armitage told Femail: 'The cross body bag adds a cool girl edge in keeping with Meghan's signature style.